Wholesome now tracks 'net carbs' which indicates the the carb count without fiber (but don't worry, you can see fiber separately). 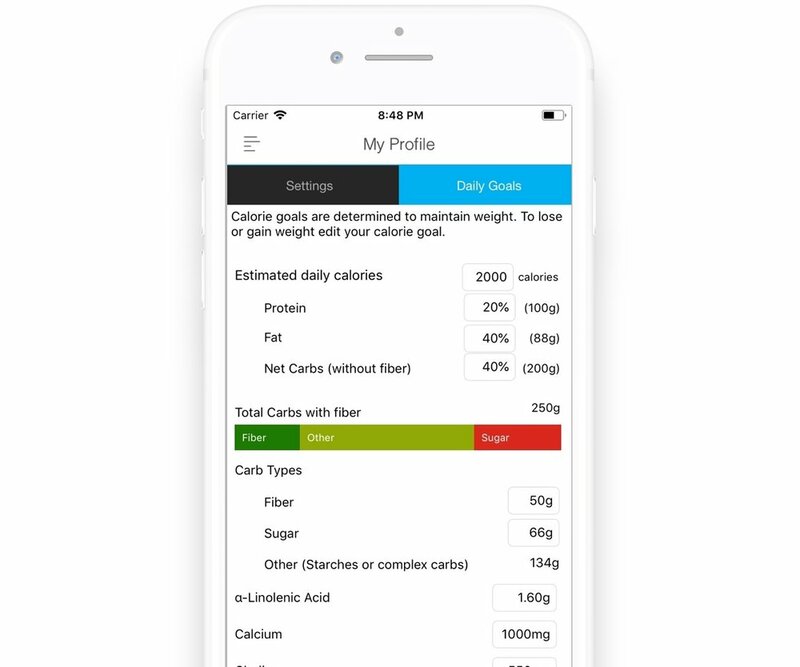 If you'd like to view your nutrition tracker in grams instead of percent, go to app settings and select "show all nutrition in grams". Wholesome has the most comprehensive nutrient database for tracking including macronutrients, vitamins, minerals, phytonutrients, antioxidants, and omega 3s. You can set your daily goals for each nutrient and track toward your daily goals by % (left image below) or simply see what you've eaten in grams (right image below). As part of the tracking experience, Wholesome also identifies nutrition gaps in your diet and offers food suggestions to fill them. Easily customize your daily goals. Because the ketogenic diet calls for eliminating several healthy foods such as legumes, milk, and most fruits, it can lead to nutrient deficiencies if you stay on it long-term. If you are following the ketogenic diet, be sure to track your nutrients with the Wholesome app to make sure that you’re meeting your nutritional needs. Nutrients to keep a close eye on while following a ketogenic diet plan include calcium, vitamin D, selenium, magnesium, phosphorus, fiber, and iron. Want to change your net carb goal? You can easily adjust it in the app settings. Note that the net carb goal is a percentage of your daily calorie intake along with protein. One of the most difficult parts of following the ketogenic diet is making sure that you stay in a state of ketosis (when your body burns fat and uses ketones for energy instead of carbohydrates). To make sure you’re staying on track each day, simply adjust your macronutrient goals in the Wholesome app to about 70% fat, 20% protein, and 10% (or less) carbohydrates. For example, if you’re following a 2000 calorie diet, that would be 50 grams of net carbohydrates each day. To make this change, open the app, click “my profile”, “daily goals”, and the “edit goals”. Now you’re ready to start tracking! Wholesome let's you create and save your own foods and recipes and calculates how many carbs and net carbs are in them (along with 90 other nutrients). You can also browse community recipes or see your Facebook friend's recipes. With just one-click you can track an entire recipe. Wholesome calculates the net carbs and total carbs in your recipes (left) and foods (right). View in your choice of % daily goal (left) or grams (right). Wholesome was created by a cancer survivor who wanted to get the most out of a whole food diet. To date, Wholesome for iOS has had over 250,000 downloads and over 1.5 million whole foods tracked. The app has been featured on BuzzFeed, LikeHacker, CultofMac, and The Seattle Times. I was looking for something to help me keep track of nutrients in the foods I'm eating. This is so much more than I imagined! Super easy to use and the suggestions on what to eat next to round out your macro and micro nutrients is amazing! I have great hopes this app will help me drop some weight in a strengthening and health building way. I love inputting what I ate for the day and asking for suggestions on what I can eat to fulfill my nutritional needs. I've learned how there are certain vitamins I don't eat much of and I'm starting to include these into my daily nutrition. Thank you! !